High water surrounds an apartment complex on Bryan road after heavy rains caused water to rise and flood whole neighborhoods on Thursday, June 21, 2018, in Mission. 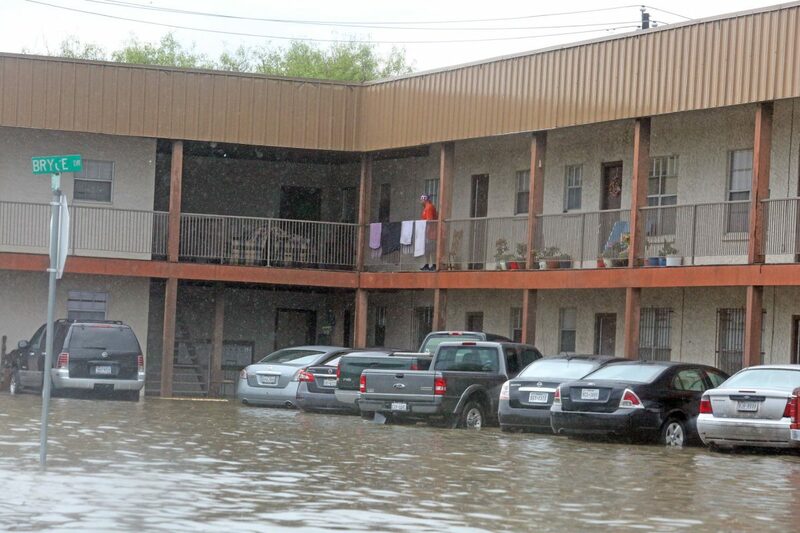 Home and business owners affected by June storms, which flooded large parts of the Rio Grande Valley, have only a few more days to apply for federal assistance. Tuesday, Sept. 4 marks the 60-day deadline since the president issued a federal disaster declaration for Hidalgo and Cameron Counties, and residents have until 11:59 p.m. to apply with the Federal Emergency Management Agency to see if they qualify for federal aid to cover damages sustained from heavy rainfall. Applicants are not required to have flood insurance. FEMA may accept late applications on a case-by-case basis, sometimes up to 60 days after the registration period closes, according to Andrew Van Singel, director of the American Bar Association Young Lawyers Division’s Disaster Legal Services program. So far, FEMA has awarded approximately $28 million in assistance to the nearly 5,000 applicants it has approved since the July 6 disaster declaration, according to the agency’s website. FEMA’s Disaster Recovery Centers in McAllen and Mission — where FEMA personnel are on hand to assist with in-person applications — permanently close after Tuesday. The DRC in Weslaco, however, will remain open indefinitely to help residents appeal FEMA award decisions. Applicants can appeal both denials and grants they believe are too low. “It pays to appeal; FEMA doesn’t always get it right the first time,” said Tracey Figueroa, disaster assistance group coordinator at Texas RioGrande Legal Aid. TRLA’s attorneys helped homeowners affected by Hurricane Harvey recover an additional $400,000 through the appeals process, she said. One of the most common reasons why Rio Grande Valley residents are denied FEMA assistance is because the agency has difficulty verifying home ownership or occupancy, according to Figueroa. >> You can submit a disaster assistance application online at www.disasterassistance.gov; by phone at (800) 621-3362; or by visiting a FEMA Disaster Recovery Center (DRC). >> The DRCs in McAllen, located at 700 N Main Street, and Mission, located at 115 S Mayberry Road, permanently close after Sept. 4. They are open that day from 9 a.m. to 7 p.m.
>> The DRC in Weslaco, located at 275 S Kansas Ave, will remain open Monday through Friday from 9 a.m. to 7 p.m. and Saturday from 9 a.m. to 3 p.m.
>> Texas RioGrande Legal Aid provides free legal assistance to low-income homeowners and renters. Anyone seeking help appealing a FEMA decision can call TRLA’s disaster assistance hotline at (866) 757-1570 to see if they qualify. >> The State Bar of Texas legal hotline, at (800) 504-7030, can connect callers with legal aid providers in their area. Its Lawyer Referral & Information Service, at (800) 252-9690, can also connect callers with lawyers in their area. >> More information on disaster relief resources is available at www.texasbar.com/disaster.